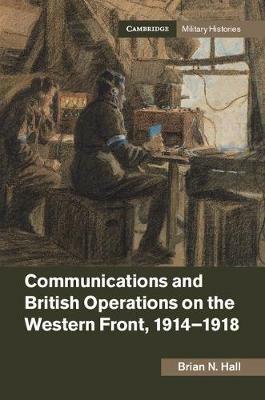 This is an important new study examining the military operations of the British Expeditionary Force in 1914-18 through the lens of its communications system. Brian Hall charts how new communications technology such as wireless, telephone and telegraph were used alongside visual signalling, carrier pigeons and runners as the British army struggled to develop a communication system adequate enough to wage modern warfare. He reveals how tenuous communications added to the difficulties of command and control during the war's early years, and examines their role during the major battles of the Somme, Arras, Ypres and Cambrai. It was only in 1918 that the British army would finally develop a flexible and sophisticated communications system capable of effectively coordinating infantry, artillery, tanks and aeroplanes. This is a major contribution to our understanding of British military operations during the First World War, the learning processes of armies and the revolution in military affairs.